Ayurveda means “Knowledge of Life” in Sanskrit. It is the indigenous health science of India but so much more than that. It is a vast ocean of knowledge, whose many branches include surgery, herbs and food supplements, rejuvenation therapy, diet and exercise including yoga . Its wisdom is said to be as old as Time itself and its scope is truly universal and holistic. It provides a practical basis for the ‘Art of Living’ in harmony with ourselves (our inner nature) and the Universe (our outer Nature). The most profound aspect of the Ayurvedic paradigm is its acknowledgement of our own individual uniqueness, and an intellectual construct that provides the basis for self exploration and discovery of our special nature and its relationship and interaction with Nature at large. Ayurveda recognises three primary motivating principles in Nature that govern all manifestations. Everything we hear, touch, see, taste and smell as well as everything we feel inside is a unique combination of these three governing impulses. 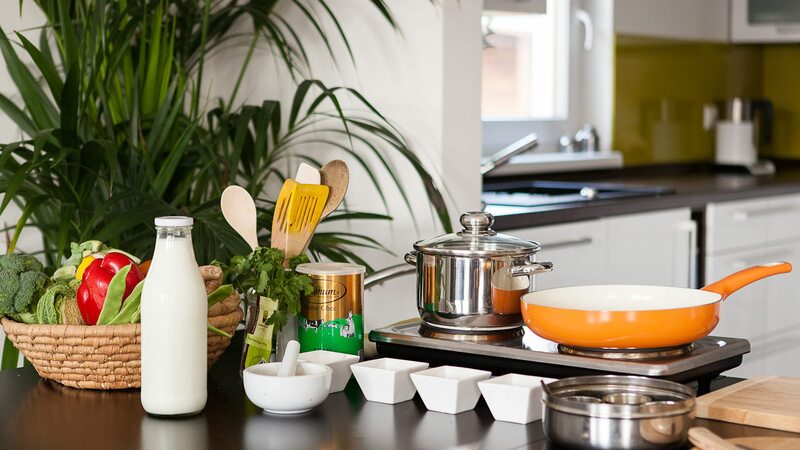 The three principles are those of Movement, Transformation and Stability, and the results of these are called Vata, Pitta and Kapha (The Three Doshas) in Ayurvedic technical terms. These ‘Doshas’ give rise to the three primary BodyMind (constitutional) types also known as Vata, Pitta and Kapha. Knowing our BodyMind type allows us to interpret our interaction with our world with greater meaning and effectiveness. Which one could be you? Victor is predominately a Vata type. 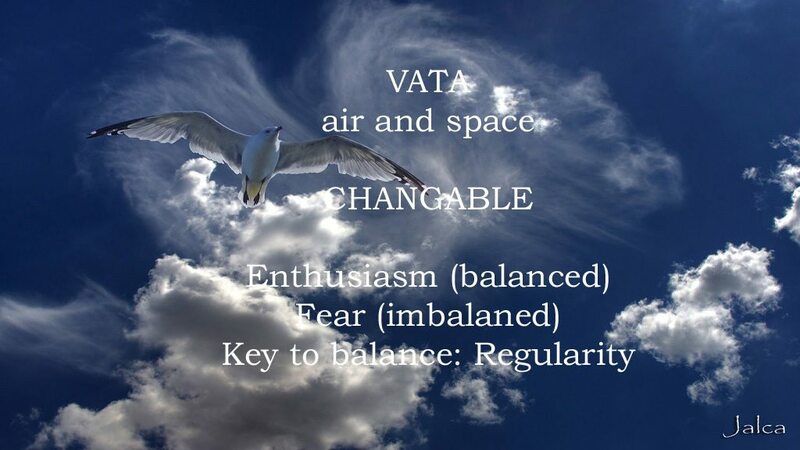 Vata is best understood by considering our experience of the element of Air. 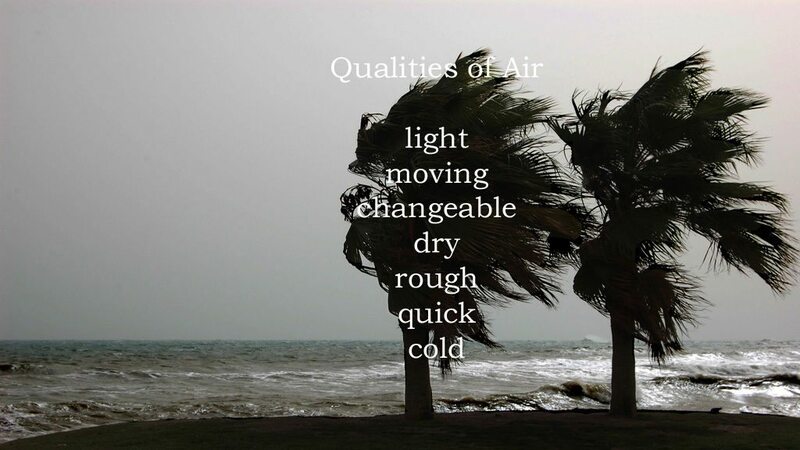 What are the qualities of air?……. It is always moving (mobile), cold, dry, light, thin, subtle (cannot be seen). So Victor is short (or tall) and thin, tendons and bones showing easily. He’s got dry skin, curly hair and small eyes. He often is constipated (dryness) and has gas (wind). He is always moving, sleeps interuptedly, learns things quickly and forgets quickly too. When stressed he gets anxious (agitated movement) or fearful (cold with fear). 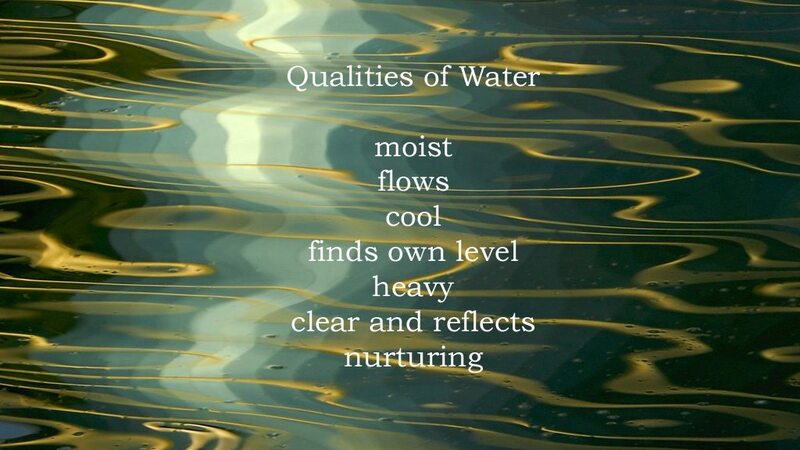 Notice how all these qualities are like air and movement . Woody Allen maybe a classic Vata. Paula is predominately a Pitta type. 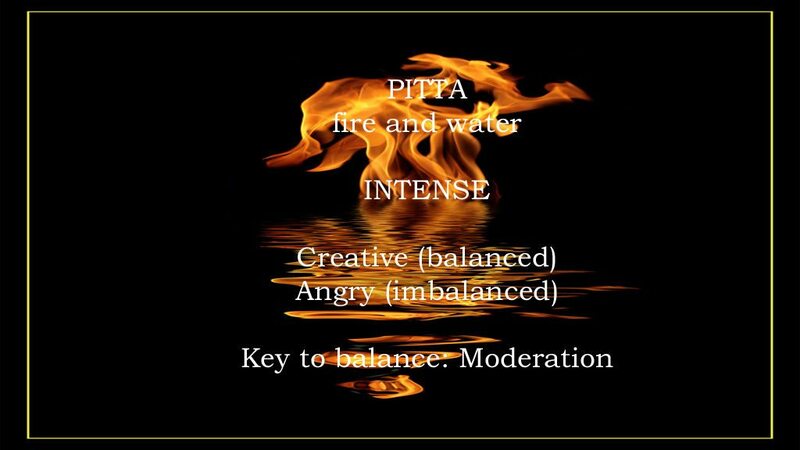 Pitta is best understood by Fire (the great transformer). Consider a flame for a moment. What are its qualities? …….. 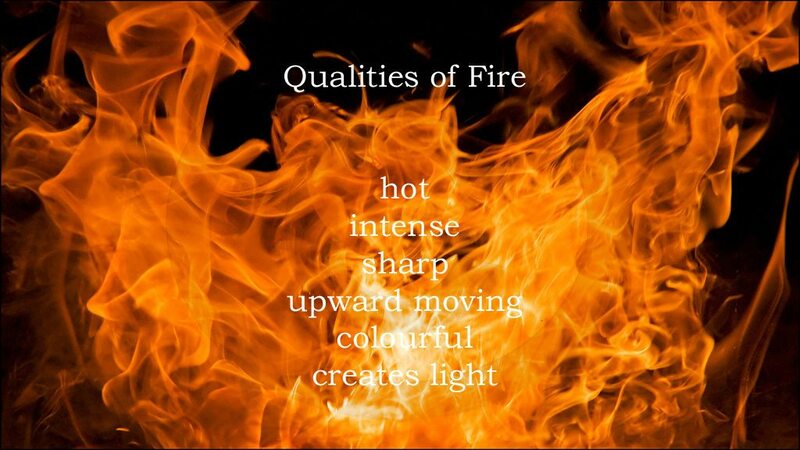 It is hot, sharp, penetrating, light, upward moving. So Paula is upwardly mobile, ambitious and passionate (the burning passion) about all she does. She is a redhead or blonde (or prematurely grey – ashes) her voice is loud (the roar of the fire), she is an athletic type especially in the upper body, sleeps well, is known for her ravenous hunger (“where is my meal, waiter?”). As in the car she is angry and judgmental when stressed. Pitta is the entrepreneur, the go-getter. The corporate world is full of the pitta type. Shirley McLaine may be a Pitta type. They are heavy, cold, stable and solid. Earth and Water make mud so Kapha is also sticky, smooth, sweet and soft. So what does Kevin look like? He has a big, stocky build, tending to hold weight on. He’s got smooth oily skin and strong white decay resistant teeth (stable). His movements are graceful (water) and slow. His sport is front line rugby, pushing and shoving. He sleeps long and deep and saves his money well. He is calm and steady, unruffled but when stressed tends to sit through it or gets depressed (stuck in the mud) or complacent (resistance to change). They are the ‘salts of the earth’. We all have a friend who we rely on (lean on) for support who may be a good example of Kapha. 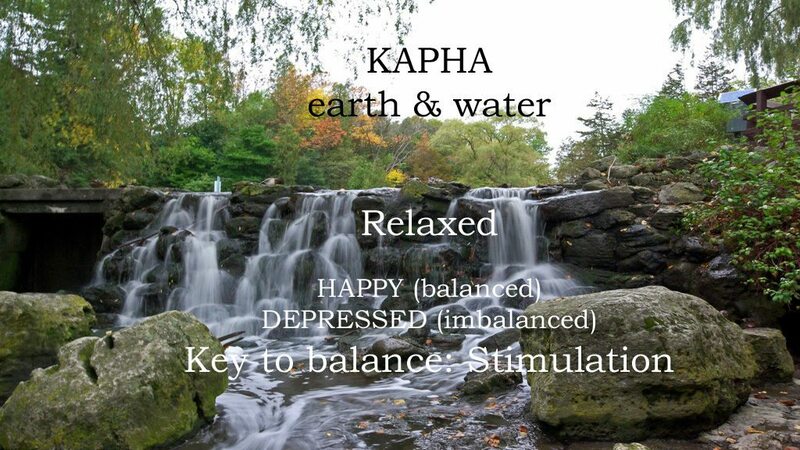 (Kapha is composed of the qualites of Water and Earth). So, how to make practical use of this paradigm? How does it pass the ‘So What’ test? Ayurveda has as its main principle – “Like increases like”. Vata, by nature is light and dry already, should eat foods that are of an opposite quality – moist, unctuous (oily) nourishing foods and favour sweet sour and salty tastes. They should avoid cold, windy, dry places. Soups and Hearty Stews or Dhal are wonderfully grounding for Vata. Pitta is hot and intense and so should favour cooling foods like milk products, salads and naturally sweet foods like ripe fruits, yes even an icecream may be good! Sweet, bitter and astringent tastes pacify a burning Pitta. Vegetables in Coconut Milk will cool down Pitta. Kapha, already cold and heavy, responds to a pungent (hot) light and dry diet. Their best foods are warm and favour pungent, bitter and astringent tastes. Spicy curries of bitter leafy greens, dry baked foods and puffed grains (popcorn) are excellent for Kapha. Aubergine with Tomato and Zucchini and mustard seeds will be tasty and stimulating for Kapha. This is a very simple introduction to a profound subject and there are now many good books, and some courses (see Events ) available to deepen your understanding, but I suggest you have some fun with it. Consider their qualities in your experience and find those same qualities in all things in your life – in your friends, foods, emotions, activities and identify them as expressing Vata, Pitta or Kapha. – Are you anxious or fidgety (Vata)? – Or hot under the collar (Pitta)? – Or do you just not care, complacent or depressed (Kapha)? And then pick something to eat or an activity to counteract that quality. Or cook some ‘dosha’ pacifying dishes. If you feel good you are probably, at that moment, in balance. Balance is not static but, like standing on one leg, requires constant minor adjustments. If feeling balanced enjoy eating what you like but ‘chew it well’! Ayurveda gives us the pattern to make order from a seemingly chaotic random universe.